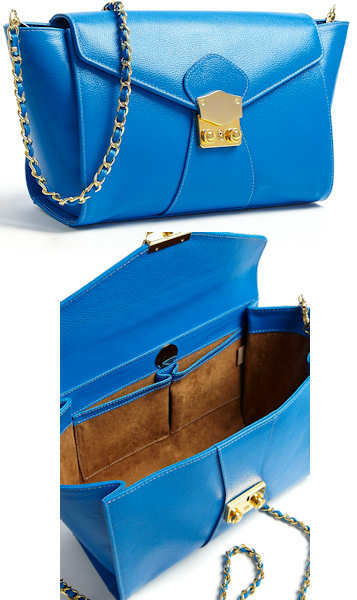 The Aila Blue Clutch Bag is an all leather bag in a bright shade of blue. The bag is a flap over style with golden hardware throughout and a golden pushlock clasp on the front. It is made from grainy leather and sumptuously lined in brown suede. The single internal compartment has two slip pockets. This bag has a removable chain and leather strap. Measurements: 27cm / 10.6″ x 19cm / 7.4″ x 13cm / 5.1″; all measurements are approximate. Aila bags are handmade and come in a range of brightly coloured leathers. This blue beauty is exclusively available at my-wardrobe.com and is perfect for adding a dash of colour into day and evening looks. This is a new brand and, looking at the quality and style of this bag, I think Aila bags are going to be extremely popular.